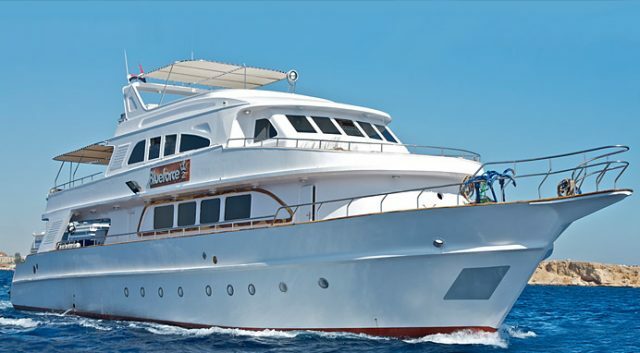 The 28 meters Blue Force 2 liveaboard offers scuba diving cruises on the Red Sea. It’s easy to get confused as the fleet has another vessel by the same name sailing in the Maldives, which you can find here. The Blue Force 2 welcomes up to 17-18 guests in 9 beautifully appointed cabins. 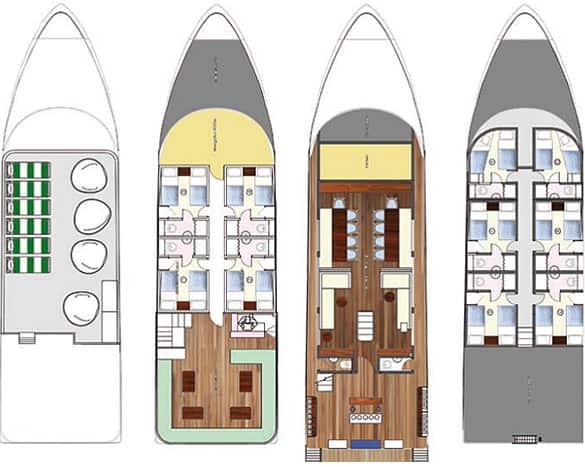 Each cabin comes with air-conditioning as well as a private en-suite bathroom. The cabins all feature cozy twin beds at the exception of one cabin which is a single cabin. Moreover, the 4 cabins located on the top deck each display a huge window. 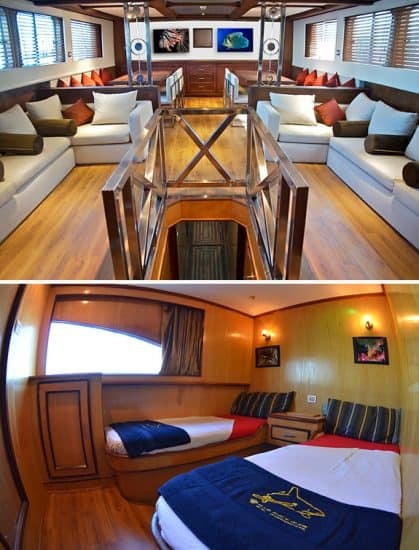 Visit this page to compare liveaboard & prices on the Red Sea! The main social area on the Blue Force 2 – Red sea is the salon & dining room located on the main deck. Indeed, the sizable room, as pictured above, is a favorite among divers. First, it’s fully air-conditioned. Second, there’s comfortable seating both in the dining room and the salon. Moreover, the salon features couches, a big flat screen TV and complete media library. Plus, there’s a corner bar where you can get refreshments from. Furthermore, there is a large sundeck featuring loungers and bean bags. Needless to say, that is also a favorite among divers as it’s perfect to chill out and enjoy the view of the Red Sea. The Blue Force 2 is a newer boat and it seems to uphold the standard of the Blue Force fleet. It’s sistership on the Red Sea is much bigger, it’s the Blue Force 3. Otherwise, the Blue Force fleet is also in the Maldives with the Blue Force One. The fleet of the Blue Force 2 liveaboard is owned by the world wide company Blue Force Diving. 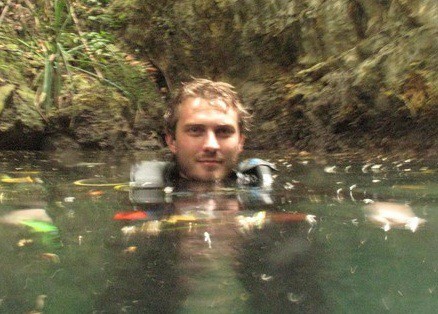 Indeed, the dive team on-board is highly skilled and professional. You will be in good hands! Moreover, the dive deck was well thought and made spacious so everyone can move around easily. Also, there are two zodiacs helping in the diving operation. Finally, everything you might need is available on-board, they simply ask to reserve your material when booking! Please visit the Red Sea Blue Force webpage to view schedules & prices. If you have been diving on board this liveaboard dive boat in Red Sea, please share your review and let us know what you thought. Please post your comments in the review section below, by doing so you will help fellow divers to plan their next diving trip . No Liveaboard Review yet on this page, please comment if you have been on the Blue Force 2 – Red Sea cruise. Blue Force 2 sails as a scuba diving liveaboard on the Red Sea!